If you’ve done a detox with us, you’ll know that watercress features daily on our menu in a green juice, alternating with parsley as a “feature flavour”. But I thought I’d share with you a bit more about the watercress “why” and hopefully inspire you to bring it into your juices and meals at home on a more daily basis! 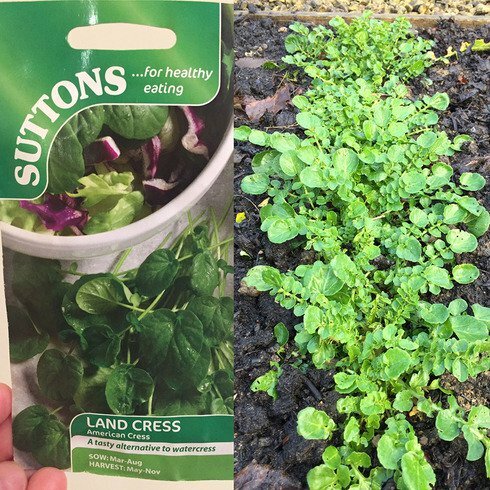 We grow land cress in the Milestone garden and it is very similar to its water-grown cousin but as a cut-and-come-again green vegetable, it is second to none. The picture here is of the seed packet so please get one soon and plant it – it’ll grow in a pot, a grow bag or in the earth very easily with water. Watercress possesses a flavor rather reminiscent of mustard but with a zingy “bite” that makes it something of an acquired taste. So what makes this “bite” so important? It’s one very beneficial nutrient that contains the anticancer compound phenylethyl isothiocyanate or PEITC. Whenever it is juiced, crushed, chopped, or chewed, watercress releases a peppery flavor, evidence of the PEITC content. The more pungent the taste, the more PEITC is being released, and the greater the health benefit. In addition, watercress contains generous amounts of vitamins A and C, along with hefty doses of calcium, folic acid, potassium, and iron. (Note the electrolytes!) Regular consumption of watercress boosts kidney efficiency and does away with hunger pangs. Best of all, watercress is a superb natural diuretic, serving as a powerful tool for reducing water retention and bloating. In addition, it supercharges weight loss! For a quick main or attractive side consider the following combinations. By adding savoury soaked nuts and superfruit sweets, you get very satisfying, water-rich combinations. Watercress and Pomegranate Salad: Watercress + soaked pecans + pomegranate seeds + chopped pears with a dressing of mixed pomegranate syrup (available at Sainsbury’s), walnut oil and seasoning. May add feta. Watercress Waldorf: chopped apples + soaked walnuts + fresh or dried goldenberries (physallis) + chopped celery + watercress + veganaise + honey + lemon juice. Watercress Soup: Usually made as a cream-based soup, try making it as a broth-based soup by first softening onions in a heated (salted) broth, adding cumin then blending the raw watercress and the warm broth together. Add chopped coriander as garnish and voila – make as much or as little as you like (this also freezes well). When selecting watercress, look for glossy, dark-green leaves and crisp stems. Typically, young watercress contains less mustard oil than older watercress but is easier to digest, allowing the body to get the most benefit from the phytonutrients. I suggest storing it wrapped in plastic with damp paper towels in the refrigerator. This method should keep it fresh for about one week. Also note that you must take the time to clean watercress before using it. Because it’s grown in water it can carry water-borne parasites like giardia— and you don’t want to take any risks. I recommend using the Chemist’s Formula. Simply fill a bowl with the desired amount of liquid in a 4:1 water to malt vinegar ratio, soak for 20 minutes, and rinse the watercress off with water. This works for your other fruits and veggies, too! Whether you’re enjoying a soup or salad, the fiery kick of watercress—along with the detoxing benefits—will make this the food to fall in love with this summer.